A website of Dover of times gone by and events and photos from my travels around the town. I will be transferring www.doverpast.co.uk as time allows. The below postcard is likely to come from the 1920's and is simple entitled, "Aycliffe, Dover". At first I expected them to have been demolished as part of the A20 road project in the 1990's, but after enquiries on Dover Forum, it turned out they still existed ! 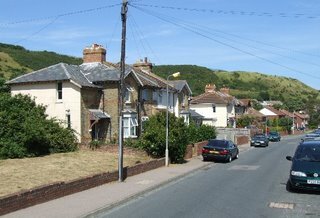 Driving along Old Folkestone Road it was evident that the housing estate had sprung up during the past decades below the hills of the Western Heights. Research shows that in the 1930's they were called Aycliffe Cottage, numbers 1-8, on Archcliffe Road (Archcliffe Fort being a few hundred metres away). In the background can be seen one of moats of the Western Heights defences, below which can been seen the King Lear public house further down the road. 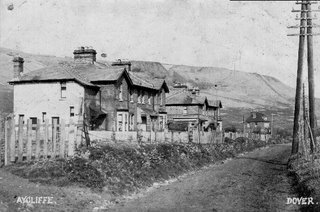 Welcome to the new Dover "Then and Now" Blog !